The EL2502 output terminal modulates the pulse width of a binary signal and outputs it electrically isolated from the E-bus. The mark/space ratio is prescribed by a 16 bit value from the automation unit. The output stage is protected against overload and short-circuit. 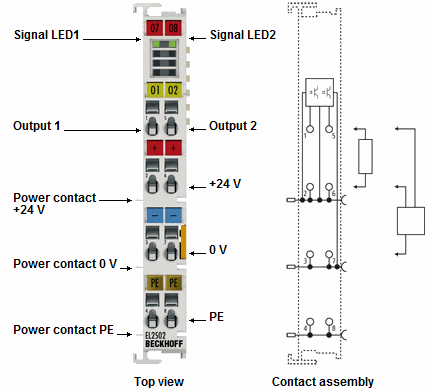 The EtherCAT Terminal has two channels that indicate their signal state via LEDs. The LEDs are driven in time with the outputs, and show the mark/space ratio by their brightness.